Coral reefs harbor an incredible diversity of life, both sea creatures we can see and microbial life that we cannot. These organisms generate an enormous number of molecules as they eat food, photosynthesize, reproduce and ward off infections. Researchers have identified several coral reef–derived molecules as having medicinal properties, such as secosteroids, which are steroid compounds used to treat inflammatory disorders; or the chemical compound bryostatin 1, derived from an invertebrate coral reef denizen known as bryozoans and being evaluated as a treatment for Alzheimer's disease. 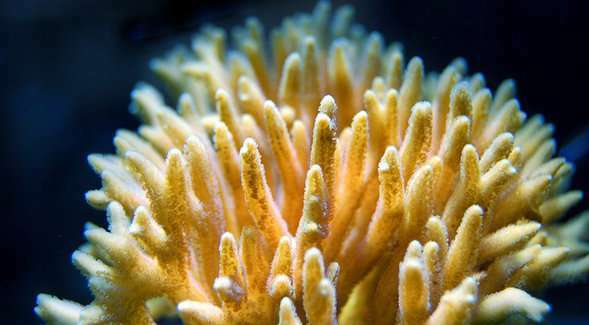 Yet many thousands more coral reef molecules with medicinal potential are unknown to science. A study led by San Diego State University biologists describes a promising new method for screening the molecular output of reef life for important chemical properties, which could make it much easier to identify the next generation of coral reef–derived drugs and better understand the diversity of molecules found in the ocean. Molecules tend to break apart in predictable ways, so by measuring the mass of these chemical pieces, the researchers were able to come up with a set of "molecular fingerprints"—patterns in the chemical profiles that point to the presence of particular molecules. So instead of screening each individual molecule one-by-one to see if it has medicinal properties, this technique would allow drug discovery scientists to easily hunt for chemical properties exhibited by known drugs. These newly discovered molecules might have benefits over known drugs—more potent, for example, or with fewer side effects. More information: Meta-mass shift chemical profiling of metabolomes from coral reefs, Proceedings of the National Academy of Sciences (2017).